This is an image from 2008 I processed recently using modern techniques. Nothing fancy, just Lightroom adjustments and a bit of tone control in Photoshop. The old 1D Mark 2 with the older 17-40. I have been getting a kick out of processing older images trying to make them meet modern standards. Killer sky in this one. 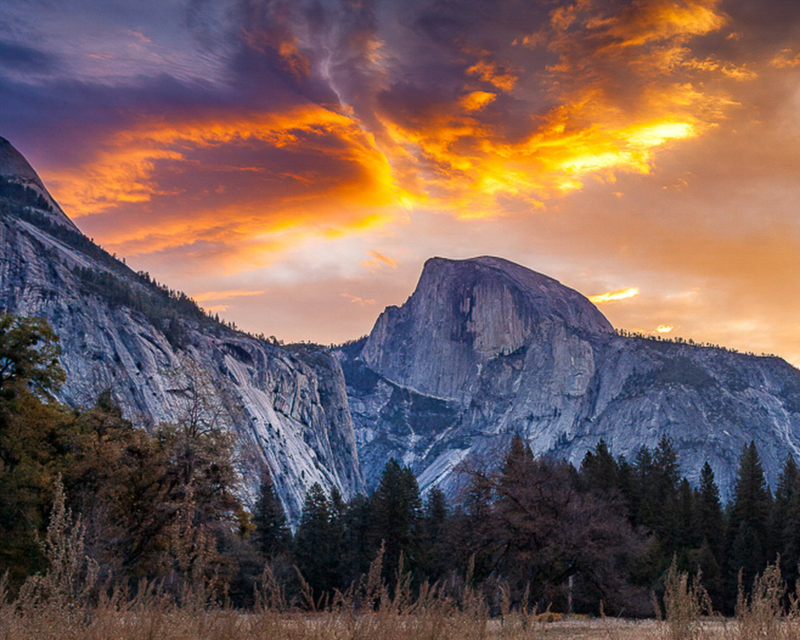 I think cropping this to from the right to a 4x3 or 5x4 would balance the image - with both Half Dome and the dramatic sky and the upward slope all on the left half of the frame, the image feels like it is balanced heavily to the left. Thanks E.J. One thing I have to learn is to be flexible in thinking about framing. I tend to be locked into the 2:3 thinking. I appreciate your excellent suggestion. OH what a beautiful sky!!!!! I could go either way on the crop or not...as long as none of that killer sky gets lost. Amazing sky-I guess everyone has ideas about cropping this. I like it "as is", but would also enjoy a crop from the right and fewer foreground browns. 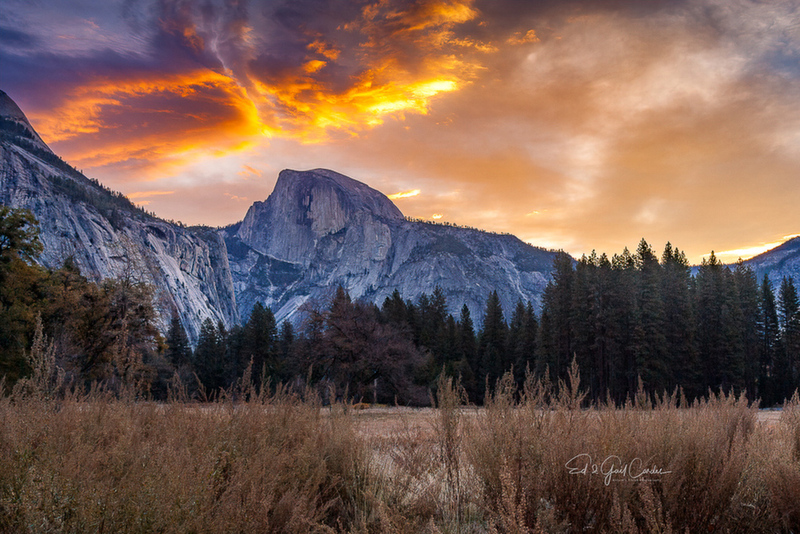 Easy enough to say when it's someone else's photo. . At least you got that magnificent sky and a great view of the Half Dome. Thanks for all the comments. I appreciate the input and have looked at alternatives. I have done a quick crop in two versions of this image. They each have their own unique positive aspects. This first one is cropped to 4X5. 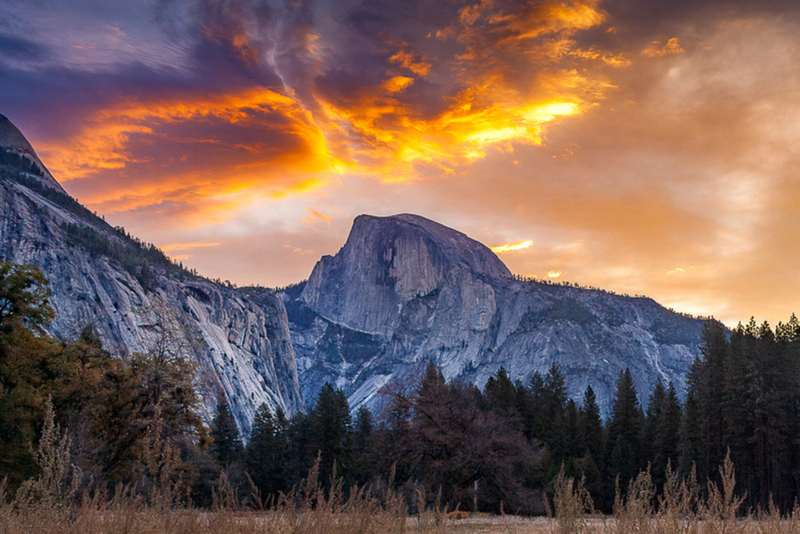 I like it as it does emphasize Half Dome and the great Sunset. However, it loses a bit of the expansiveness of the location. Sorry for the double post, but I wanted to also show another crop interpretation of this image. In this one I maintained the 2:3 ration but cropped a lot from the bottom and right. While it does, as E.J. has said seem a bit "heavy" on the left, to my eye it maintains the expansiveness of the location. While I like both re-cropped versions my preference is for this one. I really like the 4x5 one a lot!!! In the original, the rocks look like the dorsal view of a bird flying into the colorful sky with the matching curves of wings. It just goes to show how we all have our own ideas and all are valid. Appreciation of artworks and photos is so subjective. I prefer your original, followed by number three and then number two. That sky is stunning! Thanks again to everyone who commented. I kind of thought there would be differing opinions - that's why what we do is art. I posted the alternatives for the sole purpose of stimulating this discussion so I, along with other readers, could learn form it. I appreciate all of the participation. Both the original and the last version look great!